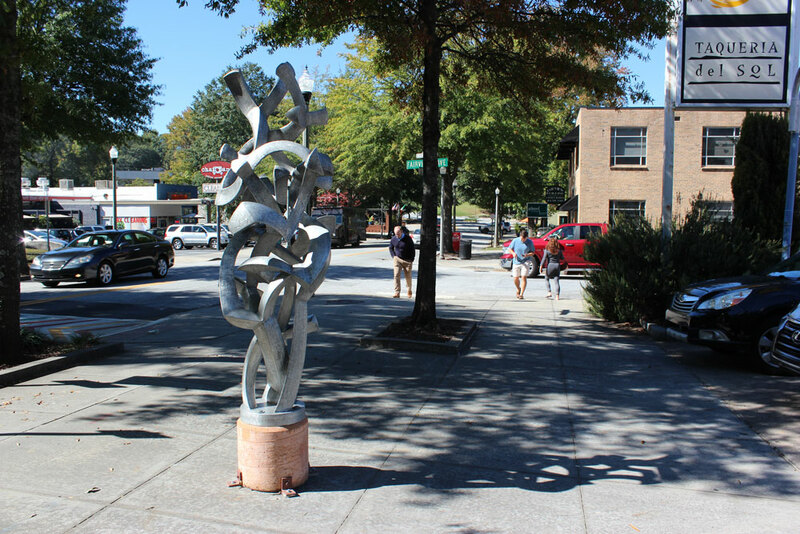 The Decatur Artway, an outdoor sculpture gallery, began in 2015 with five sculptures on display and a new phase is added each year. 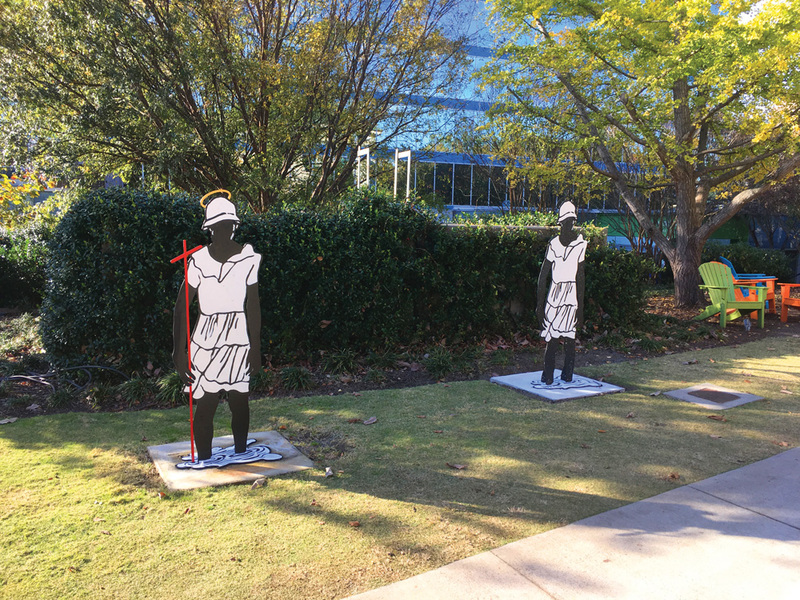 Each set of sculptures is on loan for two years, creating a dynamic rotating collection of public art. To get a personal tour of the pieces, with narration provided by the artists, download the free Otocast app from iTunes or Google Play. We all know that you’re supposed to reduce, reuse and recycle, but for me, reuse and recycle has a deeper meaning. I specialize in turning trash into assemblage art in order to focus attention on the need to use resources responsibly. The Plenum Orb sculpture is made up of pots, pans, pet bowls, hub caps, and vessels of every description, welded together into one contiguous form. It conjures up memories locked away in abandoned objects. Using a palette of familiar stainless steel items, this large stainless steel sphere contains a mix of surprise, irony and humor. My process in creating A Refusal to Stop and Ask for Directions was different from my usual process. 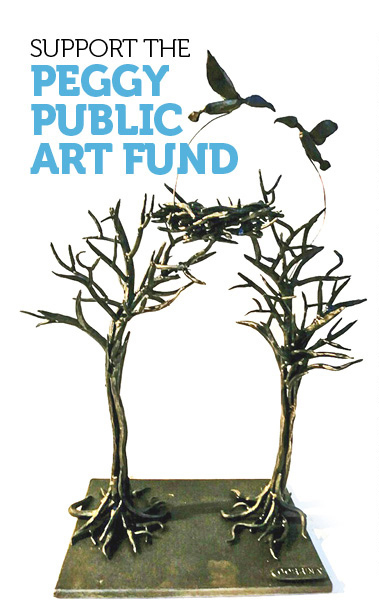 I did not design the sculpture in advance. I simply made the first section, then added the next, and proceeded in that fashion, with a general notion of the scale of the final sculpture, but without trying to envision the completed form, beyond the next two or three sections. I knew that I wanted to leave a lot of open space and create a strong, three-dimensional, slightly chaotic sense of motion. The title is a reference to the approach some people use in driving, but also a fair description of my approach to creating this sculpture. I create diverse art that reflects humanity. Helping Hands is a metaphor to promote genuine helpfulness that comes from the heart, and not from the pursuit of glory. I abide by the motto “More help, less war.” From keeping the environment clean by recycling, to taking in and rescuing animals even for a short time, by lending my own helping hands, the world is an even more beautiful place. I hope that Helping Hands inspires you to do the same. While growing up in Atlanta, my family had a pond in our backyard filled with koi. One spring morning, we were startled to see a heron hunting at water’s edge. We ran toward it, arms flailing, but it had already scooped up my favorite fish before gracefully spreading its wings and flying away. As mad as I was, it was hard not to admire the majestic killer, where both beauty and heartbreak lived so comfortably. The piece draws on the construction techniques of vintage planes, using aircraft fabric to sheath the heron’s wings. Likewise, it draws on emerging technology, using flexible solar panels to power the flapping motion of the heron’s wings. Like birds, that have relatively few, light and hollow bones, the mechanical heron is constructed of thin, aluminum tubing. 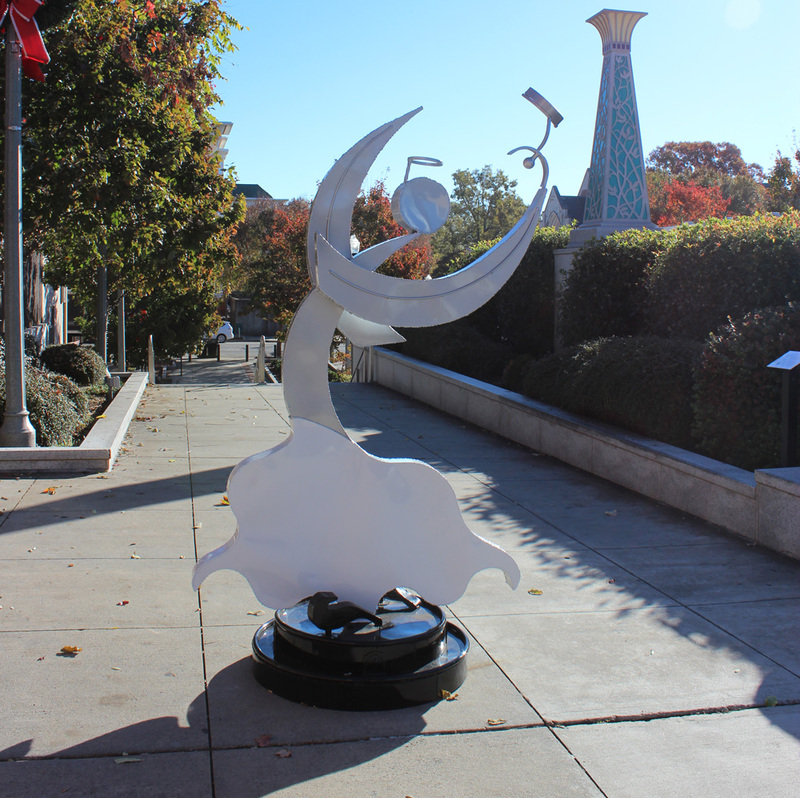 This site-specific piece is a large, solar-powered mechanical heron, constantly in flight. 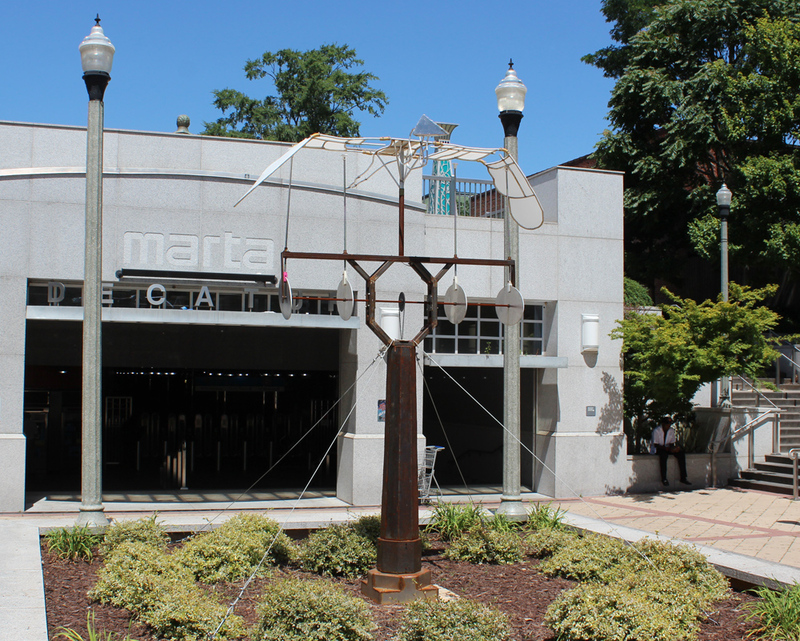 The mechanical aspect combined with the natural bird form represents the juxtaposition of Decatur – an active, bustling city defined by its natural green space. Sister is a trinity of drawing, painting and sculpture. Indeed she is drawing in space. Her graphic nature enhances her ability to recall the story of history and culture. Sister is diminutive yet powerful. Simple yet heroic. She is the matriarch and the children. She is the unheard, underrepresented, underserved, marginalized voice of indigenous Black people. You catch her out of the corner of your eye because, though rejected, she is ever present. You must confront her. You must engage her. She carries and nurtures a nation. “Cross Sister” is about the spiritual nature of the matriarch that governs and preserves the moral character of Black people. This morality, which enables harmony, perseverance and faith, is a bedrock of African-American culture. “Cosmic Sister” embodies spirituality and creation symbolizing the purpose of a people in the universe. She is a nation whose destiny is without limits. 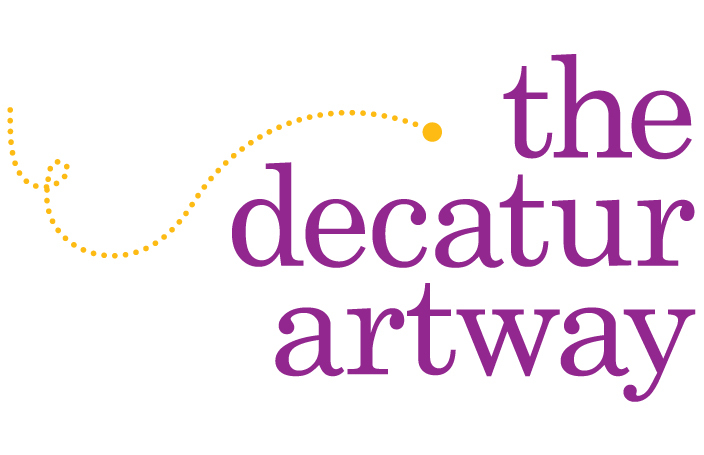 The Decatur Artway is presented by the Decatur Arts Alliance in partnership with the Decatur Tourism Bureau and the Decatur Downtown Development Authority.